Is Han-Solo Not Guilty By Reason of Self-Defence? Let’s just imagine The Last Jedi never happened and go back to more simpler times, say 1977 A New Hope . . . ah that’s better. Did Han-Solo shoot first? Did Greedo shoot first? Does it even matter? The debate about whether or not Han-Solo shot first is to refer to George Lucas’ changes to the original Star Wars movie trilogy; more specifically a change to the A New Hope Special Edition, in the scene involving the characters Han Solo and Greedo in the cantina. Han replies, “Yes, I bet you have” and proceeds to shoots Greedo under the table while Greedo is pointing a blaster at him. 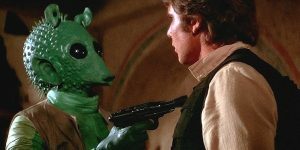 However, in the Special Edition, Greedo shoots at Han and misses, without explanation, from point-blank range, and then Han shoots him. The scene was later altered again to have Han and Greedo shooting at almost the same time (though Greedo still shoots first), with Han dodging out of the way of Greedo’s shot. It is clear the changes were made to avoid the conclusion that Han was a murderer, not a tag one wants from the, eventual, scoundrel-hero. The central objection to the changes are that it weakens and compromises Han’s rebellious and ruthless nature. Putting that aside, the generally accepted truth from fans of the franchise is that Han Solo kills Greedo in a bit of pre-emptive, badass self-defense. Everyone is right, right? To answer that question, we need look no further than the laws we accept in society for self-defense . . . whether this applies in a galaxy far-far away is impossible to know, yet for the sake of this argument lets assume that it is. The answer lies within the 15 Criminal Law Consolidation Act 1935 (SA). A person is entitled to use such conduct as he or she genuinely believes is reasonable and necessary for a ‘defensive purpose’ (that is, in self-defence or in defence of another, or to prevent or end an unlawful imprisonment). If someone charged with an offence, say Han was charged with murder, and he raises a defence under this section, it is taken to have been established unless the prosecution disproves the defence beyond reasonable doubt. This will be a complete defence to an offence, including murder, as long as the force (no pun intended) used was, in the circumstances, as the defendant genuinely believed them to be, reasonably proportionate to the threat they genuinely believed to exist. In other words, if Han genuinely believed he was about to be shot by Greedo and he shot first to defend himself, killing Greedo, then he was not guilty of murder. Evidence to suggest this was the case is that Greedo was pointing his blaster at Han during their conversation, they were within the cantina (where Obi-Wan Kenobi tells Luke “You will never find a more wretched hive of scum and villainy”) and Greedo intimates, by his words, that he is about to kill Han. This would be a partial defence to murder, reducing the offence to manslaughter, if, despite the defendant believing his or her actions were necessary, the conduct was not reasonably proportionate to the threat that the defendant believed existed. In other words, Han would not be guilty of murder but guilty of manslaughter if, despite believing that his actions were necessary, shooting Greedo was disproportionate to the actual threat Greedo posed. For example, if Greedo held a knife and not a blaster. However, there is an exception to reasonable proportionality rule, in home invasions. In the case of a home invasion acting for a defensive purpose or to defend property can be a complete defence to murder, even if the defendant’s conduct was not objectively reasonably proportionate to the perceived threat. What is required is that the defendant genuinely believed that the victim was committing or had just committed a home invasion. So, in summary, it appears like Han Solo was perfectly justified in blasting Greedo in the cantina without criminal repercussions . . . that would be, of course, if he didn’t flee Tatooine like the audiences from a Last Jedi screening! “EMOTIONAL WILLS” COULD CAUSE MORE PAIN THAN GAIN. TO PRESERVE THE INTEGRITY OF OUR COURTS, WE MUST KEEP THE CAMERAS OUT.